"Look, B, I know Gage is a loose cannon, but that's my man. We've been together since we were, like, six years old. I'm loyal to Gage just like he's loyal to you. You asking me to be a rat? I'm not the one." MPAA Rating: R for drugs, language, and violence. Many rap stars have tried to break into film. Some, such as Ice Cube and Ice-T, have shown real talent and have had successful careers in front of the camera. Many others have not. 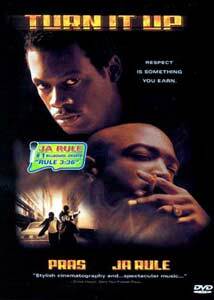 After viewing rappers Pras (a member of the group The Fugees) and Ja Rule in their first major film roles, I am strongly of the belief that both men will ultimately fall into the latter category. Turn It Up covers several days in the lives of Diamond and Gage, two lifelong friends and henchmen of an inner-city drug lord named "Mr. B." Gage is a pretty typical womanizing criminal hothead. Constantly demanding respect, he is far more inclined to use violence than logic in dealing with obstacles. Denzel, or "Diamond" as he is known on the street, is more thoughtful and intelligent. Involved in a serious monogamous relationship, he seems to be struggling with the idea of settling down. He is trying to leave the criminal lifestyle behind him and begin a career as a rap artist. By all accounts he is talented, but he lacks motivation and can't seem to be able to get his demo completed. As such, the local illustrious music producer, Mr. White, won't take him seriously. He continues to work for Mr. B in the meantime to finance his lifestyle. Gage, after being rebuffed by Mr. White, tries to convince Diamond to let him produce the album for him. When Diamond resists, pointing out how much money that would take, Gage murders another narcotics associate and steals $100,000 from him. Loads of cash in hand, Diamond foolishly concedes to Gage's ambitious plan and off they go. Things seem to go well for awhile but, before long, a major complication arises. The stolen money actually belongs to Mr. B and he has become aware of who took it. He demands part ownership of the album that Gage and Diamond are producing. Diamond resists as this would compromise his musical scruples and Gage, fearing for his life, comes up with a dangerous plan to get the money to pay Mr. B back. Events escalate and become more violent, leading to the inevitable showdown between Gage, Diamond, and Mr. B. Turn It Up fails on so many levels it is difficult to know where to start. The most glaring flaws are in the performances. Neither Pras nor Ja Rule possess any real skill as actors and their portrayals of the film's primary characters are nothing less than dreadful. Most of the supporting performances are only marginally superior (with only Vonde Curtis-Hall seeming able to immerse himself in his character). With that, it's almost a relief that the script is just as bad. "Meaningful" conversations are handled clumsily, with unrealistic beginnings and ends. The film throws every dramatic cliché in the book at the viewer, but executes none of them well. Even the film's action sequences are lackluster, offering us nothing we haven't seen done far better elsewhere. What I found most troubling, however, is that the film's message, if there is one, gets drowned in contrivances and poor characterization. If Diamond wants to better himself so badly, why does he continue to resort to violence? Impressionable younger viewers may very well leave this film with the wrong message, seeing it as a justification rather than a condemnation of the violent, criminal lifestyle that is so prevalent in our nation's inner cities. For this reason, Turn It Up dances along the line between responsible and reprehensible filmmaking. Go see John Singleton's Boyz in the Hood instead. You'll thank me for it. Image Transfer Review: As generally poor as the actual film is, this disc does do quite well in the image and audio departments. Turn It Up offers both an anamorphic widescreen and a pan and scan transfer on the same side of the disc, selectable from a menu that pops up as soon as the feature presentation is selected. The widescreen transfer features good color and clarity. The print is very clean with minimal grain. Blacks are deep with good shadow delineation. Only occasional artifacting mar an otherwise pleasing visual experience. Audio Transfer Review: With a pervasive hip-hop soundtrack, Turn It Up's Dolby Digital 5.1 audio transfer will certainly keep your subwoofer alive and thumping. This disc features very good use of the surround channels, offering a nice enveloping auditory experience, especially in the many scenes that take place in nightclubs and other public locales. Dialogue remains clear, even in these club scenes, while still offering nice rich sound from the front soundstage. Turn It Up also offers a 2.0 surround track. Extras Review: If you have a DVD-ROM drive, this disc provides screenplay to scene access and a link to the film's website. Filmographies of the film's four primary characters and the director are also included. No trailer is provided. Violent and extremely profane (the very first word of dialogue is the "F-word"), Turn It Up fails to excel in any area and offers it's audience nothing new. Unless you are a huge Pras or Ja Rule fan, pass on this one.